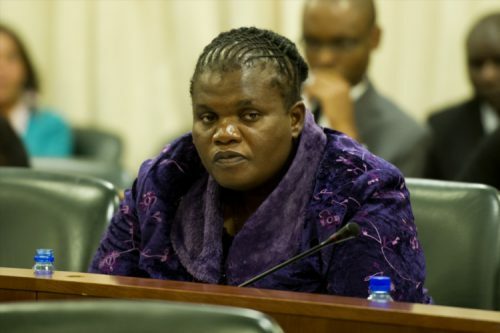 FILE PICTURE: Public Service and Administration Minister, Faith Muthambi. Photo by Gallo Images / Foto24 / Liza van Deventer. The party wants to know when the minister will be issued with a summons to appear in parliament to account for the allegations against her. The ANC’s “disgraceful” decision to fire the chairperson of the portfolio committee on public service and administration, Dr Makhosi Khoza, will not save Public Service and Administration Minister Faith Muthambi from accounting to parliament, the DA said on Friday. Mike Waters, the party’s deputy chief whip, said the DA would write to the acting secretary to parliament, Penelope Tyawa, to ensure Muthambi is subpoenaed to appear before her portfolio committee at the soonest possible date. On Tuesday, Muthambi failed to appear before her oversight committee despite travelling to Cape Town and giving assurances that she would be present in parliament. The committee was supposed to quiz the minister over allegations that she flew 30 people, including members of her family and friends, to attend her department’s budget vote at the legislature earlier this year. The Sunday Times reported at the weekend the trip, at taxpayers’ expense, cost R500 000. Muthambi also faces claims of nepotism after the paper reported she had hired friends and family members irregularly within her department. Her absence during the committee meeting on Tuesday coincided with a boycott by five ANC MPs in protest against Khoza’s public stance on the defeated motion of no-confidence vote in President Jacob Zuma last week. The outspoken MP had previously stated before the motion she would vote according to her “conscience” and called on Zuma to resign from office. ANC chief whip Jackson Mthembu announced in a statement on Thursday his office had “received a directive” to remove Khoza because of an irretrievable breakdown of her relationship with other ANC MPs. “The committee passed a unanimous resolution to have her summoned to appear before the committee. That resolution stands, and Muthambi must be summoned. If she fails to appear next time, following the summons, she will be liable to a fine or imprisonment,” Waters said in a statement. The DA also wants Muthambi to be held liable, in her personal capacity, for the costs of her trip to Cape Town, as well as the travel costs for her department’s director-general and the CEOs from the National School of Government and the Centre for Public Service and Innovation. “Indeed, an investigation must be initiated into whether or not Muthambi pressurised these persons to bunk the committee. It is a serious matter indeed if she used her influence to sabotage a committee of parliament,” Waters said.